The Neuropatholator Touch Core comprises 15 Screens. To the Starter we ADD the: Muscles, Dermatomes, Sensory Symptoms (like throbbing, shooting, numbness, etc. ), and 3D rotatable images of the spine and nerves and short 3D movies of spinal anatomy. 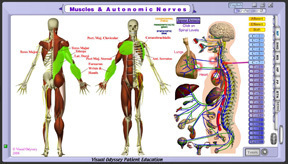 Activating a spinal level shows nerve innervation to the organs, peripheral nerve pathways, muscles and dermatomes to correlate and emphasize the immediate conditions and long-term possible consequences. With a mouse or touchscreen monitor, the experience is instant, dramatic and memorable. * Upgrade to the Bronze, Silver or Gold at anytime.